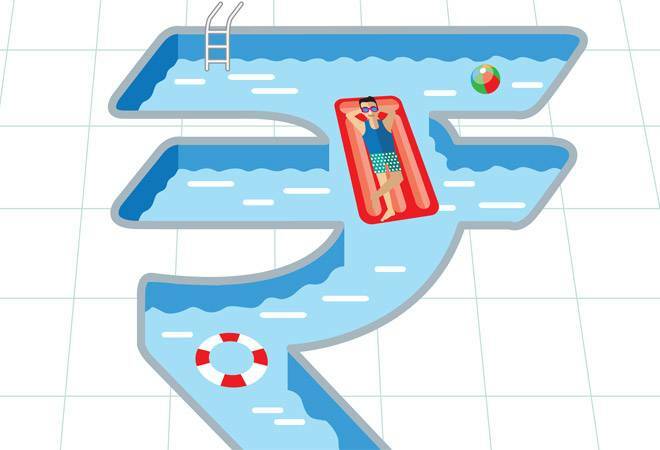 Tax-saving mutual funds, popularly known as equity-linked saving schemes (ELSS), had a good run over the past one year, starting from June 20, 2016. Their average performance was heartening, and returns rose to an average 26 per cent during the period compared to 16 per cent delivered by the BSE Sensex and 21 per cent by the large cap category. In fact, a large number of funds under the tax-saving category have returned more than 30 per cent in the past one year. The outstanding performance of the tax-saving funds is not an aberration, though. For one, they have beaten their peers over long periods, as long as 10 years (see Table: How They Are Performing). For the past five years, these funds returned 20 per cent compared to the broader market's 13 per cent, which means if you had invested Rs 1 lakh during this period, your corpus would have grown to Rs 2.48 lakh while the broader market would have given you Rs 1.84 lakh. What sets these funds apart from the regular, diversified equity mutual funds is that ELSS will ensure tax exemptions and provide an opportunity for capital appreciation, says Lakshmi Iyer, Chief Investment Officer (Debt) and Head, Products, at Kotak AMC. Tax-saving funds qualify for tax deductions under section 80C of the Income Tax Act and up to Rs 1.5 lakh of your ELSS investment is eligible for tax rebate while you save as much as Rs 45,000 annually (assuming you are in the highest tax bracket and saving 30 per cent tax on Rs 1,50,000). However, there is no upper investment limit in ELSS. The tax exemption does not apply to regular equity funds although both ELSS and regular equity funds qualify for zero long-term capital gains (LTCG) tax. Dividends received from both types of funds are tax-free for investors. Just like other equity mutual funds, tax-saving funds also invest in large and mid-cap stocks and your investment strategy should be built around that. However, these funds have a lock-in of three years, unlike a diversified equity fund that allows exit at any time, subject to applicable exit loads. For the ELSS, the lock-in is an advantage, though, as fund managers can invest for the longer term without worrying about liquidity. It also means if you opt for a systematic investment plan or SIP in this field, each investment will be locked in for three years. Before you put your money in ELSS, decide on your priorities. Are you looking at short-term goals and intend to sell off as soon as the lock-in is over? Wealth creation, however, requires mid-to-long-term investments and you need to find a suitable fund that matches your goal (see Table: Top Tax-saving Funds). Take, for instance, the Axis Long Term Equity Fund, which has a unique strategy of identifying and investing in stocks for a longer term, between three and five years. 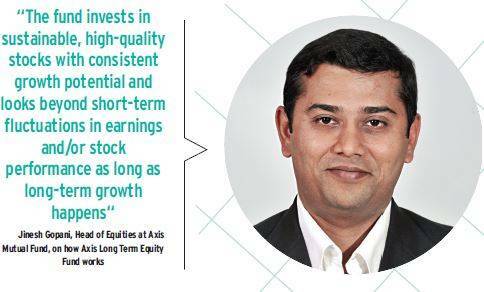 According to Jinesh Gopani, Head of Equities at Axis Mutual Fund, such a strategy ensures that the fund invests in sustainable, high-quality stocks with consistent growth potential and looks beyond short-term fluctuations in earnings and/or stock performance as long as long-term growth happens. Since its inception, the fund has run a stable and compact portfolio and focussed on identifying these opportunities across the market spectrum. As is so often the way, it had a poor year in the financial year 2016/17 as beta and lower quality stocks performed better. The fund was also hit by demonetisation when some of its key allocations in financial and consumer sectors bore the brunt of market uncertainty. But it has now recovered well. Although 20 per cent return over the past one year is not stellar enough to beat top-rung players, the overall point - that of steady growth - remains as the fund ranks among the best in the five-year-returns category with a solid 25 per cent return. Gopani says the fund's position would be linked to capturing the future growth in domestic demand over the next two-three years. Consequently, it is betting big on private sector banks and non-banking financial companies (NBFCs) as well as consumer durables (including automobiles) as its key allocations. The fund runs a multicap portfolio with bottom-up allocations across the market wherever the opportunities present themselves. Typical allocation to large cap has been 60-70 per cent over the years. 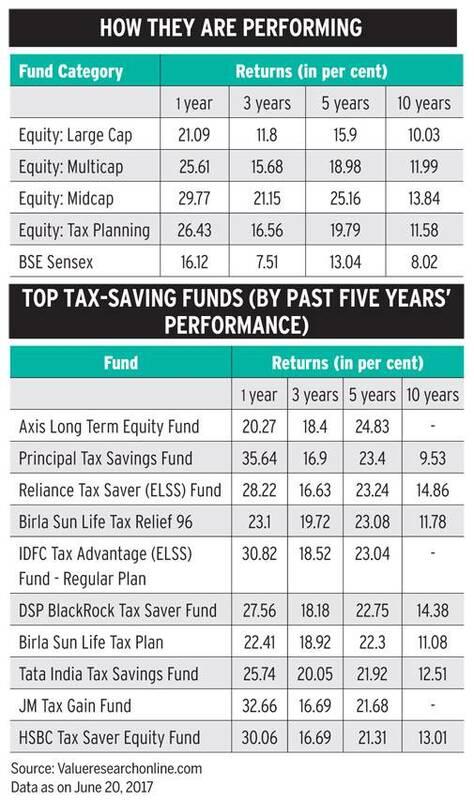 Principal Tax Savings Fund is another entity delivering top returns over the past five years. It gave 23 per cent return during that period and delivered a robust 36 per cent over the past one year. "We were able to identify good bottom-up stock opportunities in diverse sectors such as auto and auto ancillaries, cement, fertilisers, financials and aviation, and held onto them with conviction," says Rajat Jain, Chief Investment Officer at Principal PNB Asset Management Company. The fund also (opportunistically) added a little beta stock to its portfolio, which, along with greater allocation to midcaps, has been beneficial. Moreover, being underweight in sectors such as IT and pharmaceuticals worked for the fund. What perhaps clipped its return was being underweight in metals last year. However, the fund's performance is still superior. It follows a blended strategy with exposure to both large cap and midcap. According to Jain, tax-saving funds need to have some exposure to midcaps as the investment horizon tends to be three years or more in line with the nature of the fund. Mirae Asset Tax Saver Fund is relatively new (only 18 months old) but in the past one year, it has been ahead of the pack by a large margin. The fund managed 38 per cent return during the one-year period starting from June 20, 2016, while the category's average performance stood at 26 per cent. 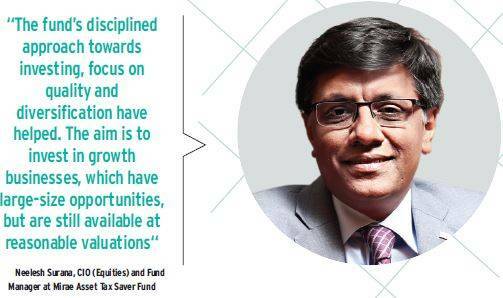 Neelesh Surana, Chief Investment Officer (Equities) and Fund Manager at Mirae, says the fund's disciplined approach towards investing, focus on quality and diversification have helped it deliver satisfactory returns. Several calls worked for the fund last year. For instance, its overweight stand in private financials such as HDFC Bank, ICICI Bank and Kotak Bank, and exposure to consumer discretionary such as automobiles contributed positively to its performance. On the other hand, exposure to healthcare sector did not work well for the fund. While the fund is size and sector agnostic, the large cap has more than 60 per cent weightage. "The aim is to invest in growth businesses, which have large-size opportunities, but are still available at reasonable valuations," says Surana. Going forward, he is confident about the consumption side of the economy and financials as several factors will help accelerate growth. These include the impact of the Pay Commission and higher real wages, fall in interest rates and the likelihood of a decent monsoon and its effect on the rural economy. Sectors, which will benefit, are retail banking, consumer goods such as autos durables, consumer staples and building materials, he adds. Are Tax-saving Funds for You? Undoubtedly, if you are keen to earn substantial tax rebate and grow your wealth by staying invested for a longer period. Work out an investment amount that will ensure maximum tax benefits. You can also consider these funds for potential capital gains if your primary objective is not tax saving. As per a report by research, analytics and data services company ICRA Online, nearly 0.88 lakh new folios were added to the ELSS category in May this year, suggesting that investors are taking their tax planning seriously and not quitting ELSS at the end of the "tax season". It also shows that we are slowly but steadily moving from physical to financial assets. If you are young and have just started building your financial corpus, investing into ELSS could be a great option. Because equity is highly risky, you will be better off investing systematically - putting in a small amount every month for a long period rather than paying a lump sum at one go. A monthly SIP will not only help you save money regularly but will also help you ride through the market volatility. Set aside a small part of your salary for the ELSS-SIP and watch your wealth grow.